4 Sep 2015 13 Sep 2015 wcalvinandersonmedLeave a Comment on Around the World and Back with the Alvin Alley Dance Company! ALVIN AILEY AMERICAN DANCE THEATER OPENED IN SOUTH AFRICA…THIS WEEK! TICKETS STARTING AT $25 GO ON SALE SEPTEMBER 8! New York – September 3, 2015 – Tonight marks the beginning of Alvin Ailey American Dance Theater’s return to South Africa nearly two decades after historic residencies in post-apartheid South Africa in 1997 and 1998, following the lifting of the international cultural boycott. Recognized by U.S. Congressional Resolution as a vital American “Cultural Ambassador to the World,” Ailey will perform in Johannesburg at Teatro at Montecasino from September 3 – 13 and – for the first time – Cape Town at Opera House, Artscape from September 16 – 20. After its Johannesburg debut, Time magazine proclaimed that “the Ailey company’s tour leaves South Africa dancing in the aisles,” and this season is sure to be equally inspirational. The Company will step off the stage and into the community to lead workshops, lecture demonstrations, and master classes for 10 days of the 18-day residency. Outreach will take place at over two dozen schools, universities, and community centers throughout the country, including Bapedi Lower Primary School in Soweto, Pretoria University, Dance Factory in Newton, National School of the Arts, and the Oprah Winfrey Leadership Academy for Girls. The 2015 residency in South Africa is made possible by lead sponsor Bloomberg Philanthropies with major support from Bank of America Merrill Lynch and the Ford Foundation, as well as assistance from travel and freight partners South African Airways and South African Airways Cargo. Renowned photographer Andrew Eccles is accompanying the dancers to take behind-the-scenes photos and video during the tour. Click through for hi-res images of outreach and performances (please credit photos appropriately). To read the Associated Press story on Ailey’s South Africa outreach, click here. And follow the Ailey dancers’ South Africa travels on Instagram: @alvinailey. While the incomparable Ailey dancers are inspiring audiences in South Africa, tickets for their New York City Center season December 2 – January 3 will go on sale September 8. Led by Robert Battle in his fifth season, Ailey’s renowned artists will bring to life an expansive repertory of two dozen works by some of America’s most celebrated dance-makers during this annual season, which has become a joyous holiday tradition. The performances will feature three new productions of Ailey Classics – Cry, Love Songs, and Blues Suite – a Company premiere by Paul Taylor, and world premieres by Kyle Abraham, Ronald K. Brown and Robert Battle – his first since becoming Artistic Director. The season will also include an Opening Night Gala Benefit, a special New Year’s Eve 50th Anniversary Tribute to Judith Jamison, and much more. Tickets start at just $25 and can be purchased at the New York City Center Box Office, through CityTix® at (212) 581-1212, or online at www.alvinailey.org or www.nycitycenter.org. The season continues in 2016 with a 20-city North American tour from February 2 – May 6, launched by a gala at the John F. Kennedy Center for the Performing Arts in Washington D.C. on Tuesday, February 2. Audiences from coast to coast will have the opportunity to see Ailey’s extraordinary dancers live in a robust repertory of world premieres, new productions, and Ailey classics. 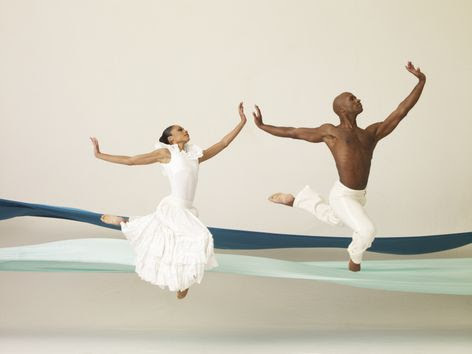 Ailey will reach new heights during the 2015-2016 season, connecting with audiences not only via the stage, but also the screen and the page. On Thursday, October 22 at 7pm, audiences at approximately 600 movie theaters across the U.S. will be able to enjoy Ailey’s big screen debut, part of “Lincoln Center at the Movies: Great American Dance,” presented by Fathom Events and Lincoln Center. 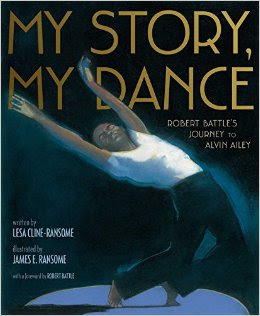 On October 27, the children’s book MY STORY, MY DANCE: Robert Battle’s Journey to Alvin Ailey, written and illustrated by award-winning husband-and-wife team James Ransome and Lesa Cline-Ransome, will be released by Simon & Schuster Children’s Publishing. Based on Battle’s life, the book tells the unique story of a young boy who, despite physical challenges and other hardships, has a life filled with music, church, and movement – first martial arts, and then, after seeing Alvin Ailey’s Revelations, dance. The book is for ages 5 – 10 and is a success story that is sure to inspire all. Bloomberg Philanthropies is the Lead Sponsor of Alvin Ailey American Dance Theater’s 2015 South Africa Tour. Bank of America Merrill Lynch is a Major Sponsor of Alvin Ailey American Dance Theater’s 2015 South Africa Tour. Alvin Ailey American Dance Theater’s South Africa Tour is supported by a grant from the Ford Foundation. Alvin Ailey American Dance Theater’s production of Revelations, Chroma, Grace, and Takademe for Lincoln Center at the Movies: Great American Dance is supported by a grant from the Howard Gilman Foundation. Wells Fargo is the sponsor of Alvin Ailey American Dance Theater’s New York Winter Season. American Express is the Official Card of Alvin Ailey American Dance Theater. Daria L. & Eric J. Wallach, Joan & Sandy Weill and The Weill Family Foundation. Southern Company is the proud sponsor of Alvin Ailey American Dance Theater’s Washington, DC Gala Benefit. Major support for Ailey’s Arts In Education & Community Programs is provided by Southern Company. American Airlines is the Official Airline of Alvin Ailey American Dance Theater. The 2015-2016 season is supported, in part, by public funds from the New York State Council on the Arts with the support of Governor Andrew Cuomo and the New York State Legislature, and the New York City Department of Cultural Affairs in partnership with the City Council. Alvin Ailey American Dance Theater, recognized by U.S. Congressional resolution as a vital American “Cultural Ambassador to the World,” grew from a now‐fabled March 1958 performance in New York that forever changed the perception of American dance. Founded by Alvin Ailey, a recent posthumous recipient of the Presidential Medal of Freedom – the nation’s highest civilian honor, and guided by Judith Jamison beginning in 1989, the Company is now led by Robert Battle, whom Judith Jamison chose to succeed her on July 1, 2011. Alvin Ailey American Dance Theater has performed for an estimated 25 million people in 71 countries on 6 continents, promoting the uniqueness of the African‐American cultural experience and the preservation and enrichment of the American modern dance tradition. In addition to being the Principal Dance Company of New York City Center, where its performances have become a year‐end tradition, the Ailey company performs annually at Lincoln Center for the Performing Arts, the John F. Kennedy Center for the Performing Arts in Washington, DC, the Auditorium Theatre in Chicago, the Adrienne Arsht Center for the Performing Arts of Miami‐Dade County in Miami, The Fox Theatre in Atlanta, Zellerbach Hall in Berkeley, CA and at the New Jersey Performing Arts Center in Newark (where it is the Principal Resident Affiliate). The Company also appears frequently in other major theaters throughout the United States and the world during extensive annual tours. The Ailey organization also includes Ailey II (1974), a second performing company of emerging young dancers and innovative choreographers; The Ailey School (1969), one of the most extensive dance training programs in the world, Ailey Arts in Education & Community Programs, which brings dance into the classrooms, communities and lives of people of all ages, and The Ailey Extension (2005), a program offering dance and fitness classes to the general public, which began with the opening of Ailey’s permanent home—the largest building dedicated to dance in New York City, the dance capital of the world —named The Joan Weill Center for Dance, at 55th Street at 9th Avenue in New York City. For more information, visit www.alvinailey.org.